Note: To see the latest updates, click here or scroll down… the newer ones are at the bottom. Cusco and neighbouring Apurímac slowly drown. The heavy rain that has affected the entire country, be it in Lima, or recently in Cusco, has only gotten worse and reached the scale of natural disaster. 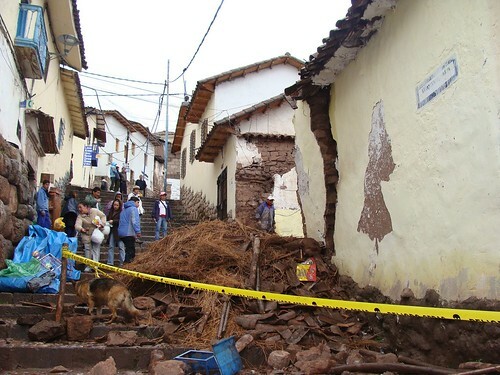 Two weeks of heavy rain in Cusco caused archaeological sites to be affected, and several families to loose their homes. In the past few days, the deluge has reached such proportions than rivers have burst their banks and landslides and rubbed the homes of the poor off the landscape. In the provinces of Cusco, Urubamba, Calca, Canchis, Quispicanchi, La Convención and Anta – bridges have been washed away, roads turned into rivers, crops of corn destroyed and people left cut off. Yesterday afternoon, central government finally declared the entire region to be in a state of emergency. They estimate the total cost of damages could be in the region of S/.40 million soles or $15 million dollars. A government delegation has been sent to the region, led by leader of the cabinet Javier Velazquez Quesquen, to organise relive efforts and bring supplies to those cut off, as well as rescue stranded tourists in Machu Picchu. Amazing videos filmed by tourists taking the train back from Machu Picchu before river levels rose further and wiped out the tracks. A landslide of heavy rocks loosened by rainfall has killed an Argentinian tourist and his guide on the Inca Trail, it has been reported. Identified as Lucila Ramballo Carlo, the 20 year old woman was crushed in her tent while sheltering from the deluge. Here tour guide, Washington Huaraya Cusihuamán died along side her. Three others were injured at the site of Inti Punku. Authorities in Aguas Calientes, below the ruins of Machu Picchu, were able to recover the bodies. Authorities in Aguas Calientes, below the ruins of Machu Picchu, have reported that those injured or in a weaker condition are the first to be airlifted out of the area and back to Cusco. So far, El Comercio has reported 66 stranded tourists have been rescued from the town while news agency RPP cites government sources that as many as 10 helicopters will be taking part in the operation from Wednesday. 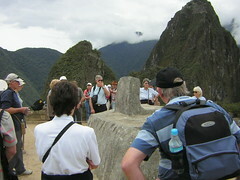 Machu Picchu is currently closed and there is no access to the site from Cusco. The BBC has the following report, as well as video of rescued tourists arriving in Ollantaytambo, where despite landslides, a road connection is being kept open to Cusco. Somewhat forgotten Apurímac, which doesn’t receive many tourists is also in bad shape. Roads and bridges and been washed out, and loss of lives and homes remains to be investigated. Towns and cities are currently cut off from one another, all the regions rivers, along side which people live, are thought to have severely burst their banks. The region has also been declared under a state of emergency, and on major efforts are under to get those stranded on buses to their destinations using heavy machinery. However… the rain continues. 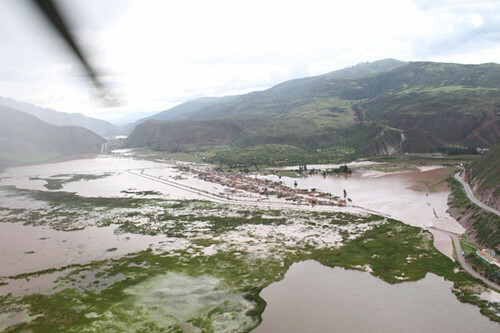 Parts of Urubamba find themselves under water due to extreme swelling of the river. See the photos by Carlos José Rey here. 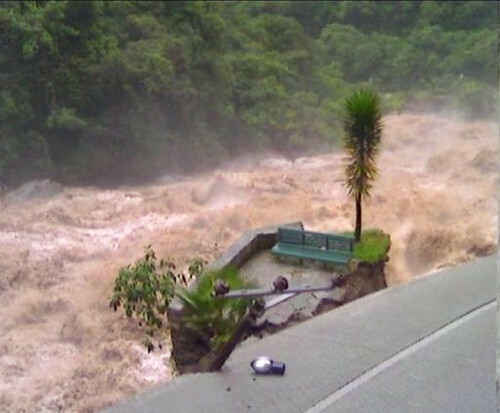 Blog KnK Explore have posted video from Daniel24580 of the swelling Urubamba river. Between $750,000 and $1,000,000 – the daily sum Cusco is missing out on because of the heavy rains that have punished the region for more than a week. The amount reflects the complete collapse of the tourist industry in both the Sacred Valley(Pisaq, Urubamba, Calca, Ollantaytambo) and the closure of Machu Picchu. This amount does not include the damage to the areas agricultural activity. 80% of crops are said to have been wiped out, and just as harvest of Cusco famous corn was about to get underway. 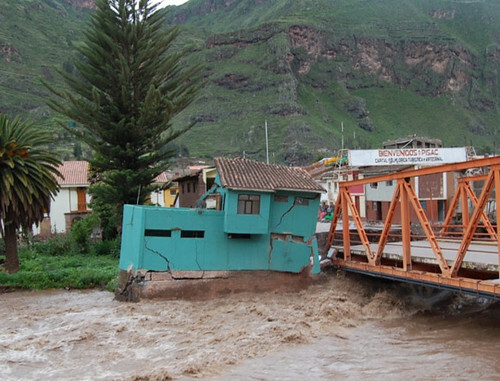 The bridge that spans the river providing access to Pisaq and the rest of the Sacred Valley has been destroyed. 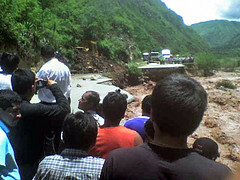 The other main bridge at Ollantaytambo is now also reported to have been washed away by the force of the river. There is currently no access at all to the Sacred Valley with all towns having been cut off from Cusco, and each cut off from one another by damaged roads and rail links. Ollantaytambo – the location to which thousands of tourists were being moved to from Aguas Calientes and Machu Picchu (with the now lost hope of bringing tourists by road to Pisaq then Cusco) is now without electricity as power cables have been destroyed. The entirety of the Sacred Valley is now only accessible by air. This amount does not include the damage to the areas agricultural activity. 80% of crops are said to have been wiped out, and just as harvest of Cusco famous corn was about to get under way. This video by multimediatonio shows what was once the town of Huacarpay. “Wiped off the map”, multimeditonio informs. The valley has been turned into a lagoon, with the river overflowing leaving many thousands homeless. Locals have fled up the surrounding hills, in the continuing rain, with no food, no water and no shelter. No help is in sight as authorities apparently try to the salvage the economic hopes of the region by dedicating resources to evacuating foreign tourists. At least 4 people are reported dead in the Puno region of Peru, home to the famous Lake Titicaca. Large amounts of damage reported and many left homeless. Reports than in agricultural areas thousands of animals have drowned. Severely affected are the districts of Ayaviri, Huancané, Azángaro and San Antonio de Putina. 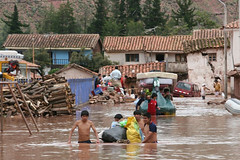 In Huancavelica deaths are reported, hundreds have been left homeless and thousands of animals drowned. Heavy rains washed out the road between Abancay and Cusco TWO days ago, and hundreds have been trapped on the open road without food and water since. 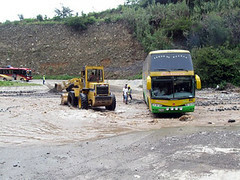 No help has arrived for the hundreds of bus passengers trapped near the Cunyac bridge as a stretch of 300m of road slipped into the raging river below. The elderly and children are most vulnerable as they have nothing to eat and drink and are completely cut off. 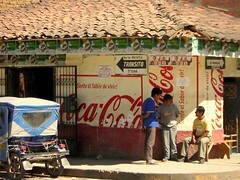 LANEWSUPDATE.COM has spoken with one of the owners of a hostel in Aguas Calientes. Francisco Seminario of Rupawasi Condor House Eco Lodge reported via telephone that there are helicopters currently evacuating tourists at this time. Yesterday 60 tourists were evacuated. 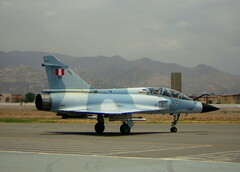 He stated that one of his guests reported that additional U.S. helicopters are being flown in from Colombia and hopefully will begin operations this afternoon. The word is that they are currently in Cusco. However, these helicopters from Colombia carry only five passengers at a time. Another reports is that individuals were attempting to leave Aguas Calientes by foot to get to the next town which is seven miles away. However, the military and police have stopped pedestrians from leaving due to the dangerousness of the situation. Also, there is a cash shortage is becoming an issue as the ATMS are out of money. 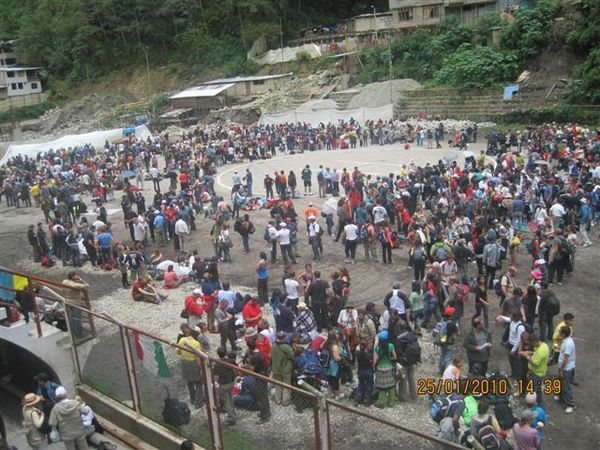 Aguas Calientes has not received any new provisions in five days and the situation is becoming critical. Vendors have raised prices to take advantage of the situation. One source indicated that it is expected it may take two to three days before the evacuation is completed. Lack of food and water, as well as price hikes by local businesses, is causing desperation for those stuck in the town. Lack of food, places to sleep and even toilets has seen a number of people become ill. Some tourist have organized themselves into groups based on their nationalities to ration supplies. Road clearances and use of alternate routes when available, mean land routes are now open from Ollantaytambo to Cusco, allowing supplies to get into the sacred valley and people to get out. There are still as many as 2000 trapped in Aguas Calientes, still inaccessible by its single train connection. Ferried out by helicopters, their rescue may take days. As many as 600 tourists have been able to leave Aguas Calientes it has now been reported by authorities, with the total number still there around the 1000 mark. Evacuation efforts have been praised by many tourists. 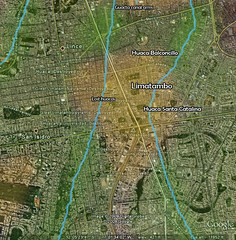 Rain in the past three days is estimated to have caused S/.800 million soles or $300 million dollars in damage. The body of the Argentinian tourist who died on the Inca trail along with his tour guide in the worst rains Cusco has seen in decades, is to have his body flown to Lima to be taken on to Buenos Aires. As more and more of the people of the southern Andes find themselves under water as rivers swell yet further, anger is growing that thousands of people are without food, shelter or water and have received no help at all in the past two days. As 10,000 people are left sleeping hungry in the rain, completely ignored by international media, aid agencies and other countries, Colombia is the first to offer assistance to Peru in dealing with the crisis. River levels are reported to be dropping somewhat for now, heavy machinery has cleared a path from Ollantaytambo to Pisac. Though there is still no connection beyond Ollantaytambo to Aguas Calientes and Machu Picchu. Peruvian weather service reports that more rain is coming, and February will be worse. Central government has allocated S/.13.2 million for families affected by the floods. Some 10,000 are said to have been left homeless across the region. The Brazilian government is offering helicopters to aid in any rescue efforts. The US embassy in Peru has apologized for sending helicopters to the flood region to rescue only US citizens and not help others in need based on health or age. “We shouldn’t have done that”, they say, after having evacuated all US nationals. Authorities report those stranded in Aguas Calientes now number around 1000. Tourists there complain of a lack of food and water, and Peruvian authorities admit as much but state that they are safe for now. All tourists who remain stranded at Aguas Calientes will be evacuated within two days, Peru’s Transport and Communications minister reports. This week some 1,200 tourists have been rescued, with about another thousand to go. Additional air traffic controllers have been brought into the area to increase the number of helicopters that are able to fly safely. “I know there are a lot of people affected by these floods, but sometimes it helps just to focus on a few people to help directly.” – Bradley Joyce, who has friends in the region, asks for your help for Paulina. Donate to her here. See how communities in Cusco are helping themselves in the wake of the devastating disaster completely ignored by the wider world and by aid agencies. Cusco is not the only region is need of help. 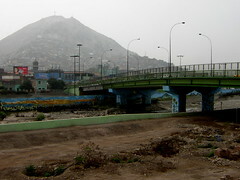 Disaster zones span the vast regions of Puno, Apurímac, Huacavelica and now Junín. A State of Emergency has de been declared in Huancayo. Unknown number of dead and destitute. Like almost everything else in the village, any form of comfort comes at a premium. Hotel rooms are exchanging hands for ever-increasing sums of money, as is food. Supplies are dwindling and nobody knows how much is left. Anything that remains on the shelf is being marked up to double, sometimes triple the price. Not everybody can afford the food at the original price. Many tourists arrived with minimal money, expecting only to spend a day or two. Now their cash has run out and the ATMs are not dispensing. A small amount of food and water made it through on the US plane and has been distributed out. Even if you get your hands on some food, there’s no guarantee it’ll be edible. The gas supply is down in Machu Picchu, so nobody can cook anything. So, everybody waits. After three days, S finally found six other British tourists, staying in a tent, which has raised her spirits somewhat. The Australians, of which there are many, have headed mainly for the bar and there’s even a slight party atmosphere. As S said, they can either sit around and be miserable or try to make the best out of a bad situation. But, for all the new friendships made, there is genuine concern about what will happen the longer the village remains cut off and no help arrives. What will happen when supplies get lower and people are fighting over the food? S is concerned that the jovial atmosphere could turn nasty quickly. There already appears to be tension with the locals. – from garyandrews.net, read more there. Peru’s weather service reports heavy rains to continue until at least February. Central and Southern Andes in states of emergency. Across southern and central Peru some 30,000 may now have been left homeless, crops destroy and livestock drowned. Little in the way of help has been received, but near Cusco some families now have tents and basic rations. Pre-read: Access to Machu Picchu completely destroyed. PeruRail estimates that with good weather conditions it could take as long as 7 weeks to repair access to Machu Picchu, so expect access to be blocked for around 3 months. Authorities have announced that all tourists have now be evacuated from Aguas Calientes, with further checks for stragglers to take place tomorrow. 1,500 homes have been destroyed as the river Ramis in Puno. 200 people are trapped on the roofs of their homes awaiting rescue. Boats to be sent in by Armed Forces to mount a rescue. The historic site of Machu Picchu is reported to be undamaged by the heavy rains. As the disaster spreads in Puno with some 1,500 homes destroyed and valley turning into huge lakes, 3000 are now being evacuated from the communities of Patascachi, Tuni Grande y Capaccachi as the Ramis river grows. They are to be relocated to nearby mountain slopes and provided with tents and supplies.